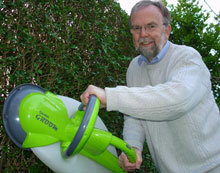 Graham Wilson is the man behind Garden Groom. He started with a very simple idea, to try and solve the problems that all gardeners face when they venture out to cut their hedges - too dangerous, too time-consuming, and too much work! 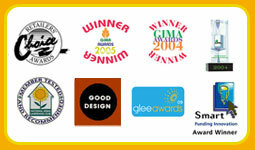 Through hard work and shear determination he has turned his hobby into a global success! Find out more about his story below. Several years ago, Graham Wilson, a retired engineer was cutting hedges in his garden in Wirral, England. After a long day, he began to think that there must be an easier and safer way to do the job. At that moment, he set out to try and solve the problems that all gardeners face when they venture out to cut their hedges - too dangerous, too time-consuming, and too much work! It began as a hobby, but the closer Graham came to solving his hedge trimming problems, the more determined he became to seeing his project fully realized. In 2000, he applied for and received several UK government grants for safety and innovation, which helped him fund the initial stages of his project. Once the concept was developed, he approached a number of leading garden tool manufacturers to produce his invention. They all rejected his concept! Graham was determined, convinced he had a concept in the Garden Groom that would dramatically benefit gardeners around the world. He believed that his invention could change a potentially dangerous and time consuming chore into a far more pleasant and safe gardening function. To achieve his goal, Graham needed to raise substantial funds and in 1999, at the age of 53, he re-mortgaged his home and ploughed all of his savings into the development of his invention. Years later, and after spending a small fortune on development, manufacturing and patent costs and with many disappointments and rejections along the way, Graham has succeeded by introducing the Garden Groom to gardeners around the world. Graham has truly solved the problems associated with hedge trimming and has presented a unique product that cuts, shreds and captures the majority of waste material and with its concealed blade, makes it virtually impossible to cut the power cord. Graham has proved that great ideas are always worth fighting for! Let Graham know your thoughts about the Garden Groom.